The tree has decorations made of olive wood from Palestine, Christmas balls of glass, snowflakes and Hanukkah ornaments. Grandma looks on at the tree-trimming party, a hijab the color of snow covering her hair. Mom, a teacher at a private Islamic school in Reston, snaps photos. Carols play in the background. Christmas cookies are baking in the oven. This tableau in a Virginia living room — a scene of family, love, acceptance, celebration and generosity — is what this season should be all about but often isn’t. You’ve gotta admit: Christmas is pretty unavoidable in this country. Gas stations sparkle with tinsel, tiny dogs wear Christmas sweaters on their walks, federal buildings are closed, Costco stops selling pies the size of truck tires in honor of the day. The other side of the wars — the “reason for the season” folks — aren’t much more palatable. Or you can take a more universal approach to the season. “I present Christmas not so much as a religious celebration,” said Nadiya El-Khatib, 33, of Fairfax County. The aforementioned Christmas tree trimming took place in her aunt’s house, where their multi-faith family of Christians, Muslims and Jews find a universal theme this time of year. “In Islam, we are taught to maintain strong ties with your family, and this includes coming together on Christmas,” she said. El-Khatib’s mother, a former Irish-Catholic woman named Mary Catherine, converted to Islam when El-Khatib was 5 years old. El-Khatib was raised Muslim, but she always celebrated Christmas with her maternal family and continues to do so with her children. Many of the Muslim families Nadeem Ahmed grew up with just gave up and started celebrating the holiday, too. But he sang carols as a boy in school, went to Christmas parties and took in the spirit of togetherness. It is unavoidable. And it didn’t really bother him as a kid, he said. Then he married a woman who was raised Presbyterian. Now he prays in church, goes there on Christmas Eve and worries about getting the right gifts for his in-laws. In other words, though he stays true to the rituals of his Muslim faith, Ahmed can find the universal, humanitarian message in Christian Christmas and embrace it. “The rituals aren’t as important as what they’re trying to symbolize and being able to explore those things at a church, or at a mosque, it’s all about trying to be a better person,” he said. Doesn’t hurt on the marriage front, either. Listening to Ahmed, I was inspired and a little saddened by the relentless war of words that continues to scar the season. Last week, I got an angry letter from a reader who was miffed that we used the words “holiday song” to describe a Christmas carol being sung by children in a photo. Turns out, “holiday song” took up fewer character spaces in the tight caption space, which is why a copy editor wrote that. But to this reader, it was a sign of political correctness and fear. It was someone picking a fight. And that’s exactly what the spirit of the season is not about. Since Christians — and I grew up one of them — seem to demand that everyone in the country observe this day as sacred (try escaping Christmas madness at a museum or anyplace else — you can’t), the meaning of the day must extend to people of all faiths, creeds and persuasions. The Muslim families I talked to did it beautifully. Whether you say “Happy holidays,” “Merry Christmas” or “Season’s greetings,” the sentiment is what is important here, not the words. And that sentiment is what we humans need these days. This day. humanity,” Obama said that in a statement issued from Hawaii, where he is spending Christmas with his family. A female suicide bomber targeted the crowd collecting food at the distribution centre in Khar. Seventy others were injured in the attack in the Bajaur tribal district, where government forces are fighting Taliban and Al Qaeda militants. Saturday’s bombing targeted the Salarzai tribe, which has joined forces with the government against the Taliban and raised a tribal militia to drive them out of their area. The Taliban took responsibility for the attack in a message sent to various news organizations. Detroit, Michigan– For the past 20 years, hundreds of local Jews have volunteered on Christmas to help needy people on a day when many Christians are busy celebrating the holiday. But because Dec. 25 falls on a Saturday this year — a day of rest for observant Jews — the Muslim community will be filling in on Christmas, helping at soup kitchens, senior citizen homes and in impoverished neighborhoods. The Council of Islamic Organizations of Michigan hopes to get 400 volunteers. The Jewish community will move its volunteer efforts to today, Christmas Eve, as part of Mitzvah Month, which refers to good deeds. Last year, the Jewish community invited the Muslim community to help out on Christmas for the first time. That partnership continues this year, with some Muslims helping on Christmas Eve, too. When Micki Grossman of Farmington Hills read journalist Helen Thomas’ comments about Zionists earlier this month, the Jewish woman was hurt. “It caused a lot of pain for me,” she said. But some Muslims and Arab Americans were upset that Jewish leaders pressured Wayne State University to remove an award in her name. At the annual banquet this month of the local chapter of the American-Arab Anti-Discrimination Committee, people wore buttons reading “Defender of Thomas,” said regional director Imad Hamad. “You can’t punish someone for the right of freedom of expression,” Hamad said, referring to Thomas, who is of Lebanese descent. Despite the differences of opinion, about 200 Jewish volunteers — along with 40 Muslim ones — will work together today to help serve poor people across metro Detroit. Grossman will be among them, glad to help people in need while bringing two communities together. Gigi Salka, 41, a Muslim from Bloomfield Township whose children attend bar mitzvahs, also will be volunteering — one of dozens of Muslims helping on Christmas. It is one way in which local Jews and Muslims are trying to build ties despite their differences on politics and foreign affairs. Last month, a health fair run by Jews and Muslims was held in a Detroit mosque. And Muslim leaders spoke earlier this year before the board of the Jewish Community Relations Council of Metro Detroit. The council organizes the event, which is usually held Christmas Day, but this year that is on the Jewish Sabbath, a day of rest for observant Jews. 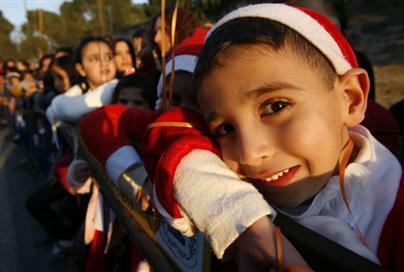 Last year, the Jewish community invited Muslims to help them volunteer on Christmas. The partnership was a historic first, with about 60 Muslims helping 900 Jewish volunteers. This year, up to 400 Muslims led by the Council of Islamic Organizations of Michigan will take the lead on Christmas. Such partnerships are playing out across metro Detroit. Victor Begg of Bloomfield Hills, a co-founder of the Islamic council who is helping to lead the volunteer effort with Muslims this week, said they “are part of an ongoing effort by our communities to bridge the gap.” He had no comment on the Thomas controversy. Hamad said he was upset over the Jewish community’s pressure on WSU to drop the award in Thomas’ name, but he maintains contact with Jewish leaders such as Betsy Kellman, head of the Michigan branch of the Anti-Defamation League, a civil rights group. Ismael Ahmed, a longtime Arab-American leader who is the director of the state Department of Human Services, spoke to the board of the Jewish council this month about poverty issues. Salka will be volunteering on Christmas because it is important to give back, she said. To her, interacting and forging ties with people of various backgrounds is part of her everyday life. Christmas is turning into a cultural holiday for some Muslims in the Long Island area as they mark the occasion with gifts, decorations, and family get-togethers. “Growing up, we did have a Christmas tree… I think just because he [dad] didn’t want us to feel left out,” said student Asra Arif, 20, from Deer Park. 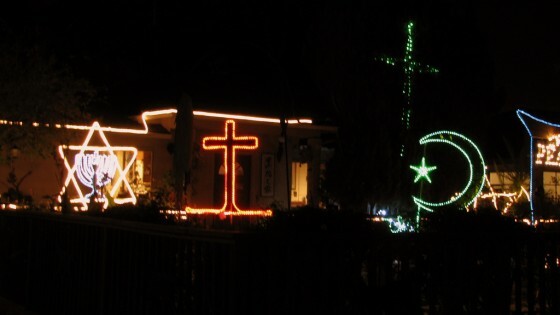 Indeed, it’s becoming almost a custom to celebrate Christmas for most Muslim-Americans. Many came from countries that don’t even have a word for “Christmas” but it becomes almost inevitable to join in with friends and neighbors who go “holiday-crazy” during this time of year. “It’s really just celebrating the season. It’s the only time of the year where families don’t have work or anything like that,” Arif said. Arif is a first-generation Muslim-American with Pakistani parents. Her family, like many others, has made it a tradition to gather with loved ones and exchange gifts during Christmas time. However, unlike Christian and Catholic families who celebrate the birth of Christ every Dec. 25, Arif’s family celebrates the atmosphere of the holidays. “I just enjoy the spirit of it. I’m not celebrating anything religious, just being with family…” Arif said. Retail manager Dafina Mexhuani, 21, from Westbury, does the same. “It’ll be celebrating to the extent of, not really Christmas… but you know like the whole decorating, and the gift giving, and all that stuff. But if you call that celebrating it, then I guess I am,” she said. She celebrates a holiday with her family every year around Christmas time, but doesn’t call it Christmas. “I grew up in an apartment building and my dad was the super. We always used to put up a tree in the lobby, and so we started doing it in my house. It’s just how it’s always been, really,” she said. Mexhuani was born in the Bronx and her family of three siblings and her parents were born and raised in Albania. She’s never experienced a year without Christmas. “The idea of Christmas we just think of generally as a winter holiday, so we don’t necessarily celebrate it… or have a significant religious attachment to it,” said Mehreen Syeda 27, from New Hyde Park, Long Island. Syeda will be celebrating the holiday season with her Pakistani-American family, because it’s the only time of the year where everyone is off from work. Though she was not born or raised in the U.S., Syeda and her family wrapped and exchanged presents, solely to be part of something that was happening culturally around them. “I think it’s important for kids to be knowing what their friends are going to be doing, and why they’re doing what they’re doing,” she said when describing how she was going to handle the holiday season with her children. Syeda said she would never steer her children away from experiencing it, though she would draw a fine line between religion and culture. Some Muslims dislike the idea of celebrating Christmas as the “holiday season.” Things like Christmas trees and stocking stuffers tend to be associated with Christmas, so some choose to avoid those all together while still pleasing their children. “We do give gifts and stuff, but we don’t have a tree or any of that up… It’s not a Muslim holiday, therefore, we don’t celebrate it,” said student Armend Cobovic, 19, from Manhattan. Cobovic and his family are from Montenegro and knew about Christmas before they moved here 15 years ago, but he was surprised to see that other Muslim-Americans celebrate Christmas. With New Year’s and other religious holidays around the end of December, it makes it the only time families get to spend time with each other. Musho Kolenovic, 18, from Stony Brook, always gets together with his family in their upstate house during Christmas time. “It’s one of the few times in the year where everyone has off, and we can meet up, and just have good old family time,” Kolenovic said. Whether they call it Christmas or not, the family time, gifts for children, and the spirit of the holidays gets the better of Muslim-Americans because of the American culture. Forget about London and France — in Dubai, airport screeners won’t be able to see your underpants. Dubai police said full-body security scanners will not be used at the airports because the devices do not correspond with national customs and ethics, according to local press reports on Tuesday. The scanners will be replaced with other inspection systems that protect passengers’ privacy, Thani said. He told the Gulf News that police are considering the use of face-recognition cameras. 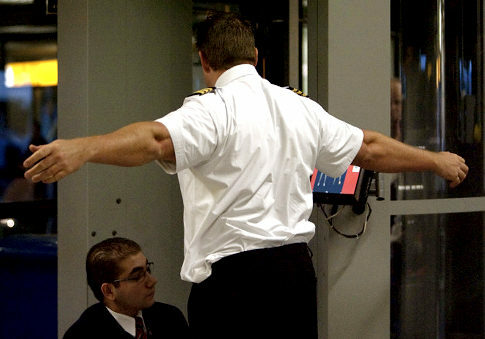 Recently, American officials have been encouraging use of the full-body scanners. Authorities say the scanners could have stopped a Nigerian man who planted explosives in his underwear in an attempt to bring down a plane bound for the U.S. last Christmas. Several European countries have tested the technology, including the Netherlands, Britain and France. South Korea and Japan have begun test programs.